I find the idea of AML BitCoin very interesting with potential; this is why I got involved from day one. AML with its patent solves a bitcoin issue. But another issue, for any cryptocurrency that aims to be used instead of fiat, is the volatility of the price. Bitcoin (BTC) has no answer to this problem; instead Mr. Antonopoulos expects that one day the Bitcoin market cap will be so large there will be no volatility. How is AML going to address this problem, since a firm would not use a cryptocurrency that is not steady. AML Bitcoin is a utility coin. Thus, we cannot speculate about volatility or market demand for legal compliance reasons. Do you have plans in the future for AML to be used as a platform for solving other problems? Yes. That is why we got involved in the project—to create a digital currency that solves various regulatory issues when it comes to digital currencies. When is AML going to be introduced? Thanks for your question. Please see other AMA answers on the site. AML BitCoin is listed on digital currency exchanges. I have also addressed the time delay with the HitBTC listing. Another project was the development of Digital Identities that is used to confirm a person’s identity; I am happy to announce that in the near future, the world will be able to have access to the system which will be in beta. I was wondering if I can get any update when this coin is going to go live on HitBTC. What is holding you guys up, or what is causing the delay? Do you have any idea on an approximate date? Thanks for your note and your faithful participation in this great project. The delays at HitBTC have been frustrating, but based on their communications with us, seem to be related to tech integration issues. As you know, our token is not an ERC-20 token. Please note that we paid their listing fees last year and before we put out a PR about the HitBTC listing, we got their written approval. I am hopeful that HitBTC will conclude their process soon, but in the meantime, our team has been working with a number of other exchanges. I assure you there is no lack of progress; our progress will be revealed very soon. 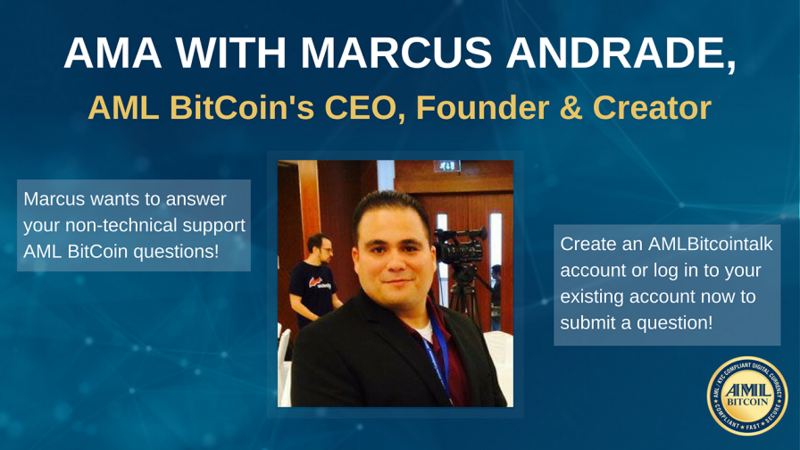 I am very glad for the milestone you achieved so far and am very optimistic about the future of AML BitCoin. We all know that any business prices game depends on the demand and the supply in addition to the value but as long as the supply here is relatively limited, then the demand will almost be everything; my only concern here is how the demand can increase dramatically even if the customers are convinced about the great merit of ABTC if the process of identification seems complicated “to them” when they know that they have to make Biometric ID before they buy from other owners of ABTC. Do you think that this can create a bottleneck in the future demand? Thanks for your message. AML Bitcoin is a utility coin. Thus, we cannot comment or speculate on demand or pricing issues for legal compliance reasons. When is the reality TV program being aired? We are filming tests this month and next, and hope to film the series this fall. As for airing and network, please stay tuned, as those announcements will only be made in coordination with the network. Please clarify whether the Super Bowl commercial was just a marketing ploy or not. Was it truly intended for airing? Of course it was made for airing! We hired a top production company, and they produced an ad that was, in our view, Super Bowl ready. Unfortunately, the ad did not air. We really wanted the NFL to allow it. It’s a hilarious and impactful quality ad. All exchanges will eventually have to be compliant, so will there be any demand or need for AML BitCoin when this happens? AML Bitcoin is a utility coin. Thus, we cannot comment or speculate on demand or pricing issues for legal compliance reasons. What exchanges apart from HitBTC are being contacted for listing? Since we’re in discussion with almost a dozen, we don’t want to foil our changes by publishing a list, as you can imagine. Stay tuned for announcements when we are close to listing on those others. Please give us detailed information about where you are and where you are headed with the roadmap. My bio is on the website and I hope we’re heading to changing the digital currency world for the better and becoming the dominant – and compliant! – force. One of my objectives is to have access to a Digital Identity worldwide so that everyone can be able to own an AML BitCoin. How will the biometric identity process work? Will we be able to conduct verification 'at home’? As soon as we are ready to roll out this amazing process, we’ll provide a how-to video that will show everyone how to participate. Stay tuned! We will be publishing the demo version online for the world to see soon. If something changes, I will let everyone know. What were the exact number of tokens 'sold' and do you intend to burn the remainder? Please provided updated metrics. We have distributed over 60 million of the tokens, and the rest of the ICO tokens will soon be distributed as well. There won’t be any tokens left to burn, even if we wanted to do so. What is the nature of the 'mergers' that you eluded to in a recent communication? Are you intending to sell off the coin/patents? As with some of the other negotiations, it would behoove us to wait until we are ready to announce a completed deal, rather than publicize them. The best outcome for all of us is a completed deal, not something we prematurely publicize, as you can imagine. We don’t anticipate ever selling off the patents, only providing licenses where it will benefit the project. Why has information been very scarce and updates from the dev team been so lacking? Most projects release comms and updates on a regular basis. The information we have been receiving is very general and vague. Yes, we are sorry about that and are endeavoring to improve communications, including this AMA, which will continue for the foreseeable future. Please provide details of what partnerships are likely, if any. You’ll have to stay tuned for those announcements, per above. Please can the company in general stop using the term 'soon' as it has actually become a bit of a meme. Also please answer the questions in the spirit of how they are asked. Please don't provide half answers that skirt around what everyone is trying to find out. Either answer the question directly and specifically or state that it can not be answered and why. Sorry for the use of the word ‘soon.’ I am open to a synonym of your choice! I hope my answers were in the spirit you desire, but please be aware that revealing some information at this time would harm the project, in our judgment. I hope we’ll have more info as time unfolds (is that better than ‘soon’?). Also, remember regulatory compliance requires that we make no representations or comments about demand, pricing or volatility as well as some other matters because AML Bitcoin is a utility coin. I have actually been an Aten Coin holder and have spoken to you personally in the past (I am from the UK). I have been optimistic for this project, although recently my optimism is waning due to all the negativity and lack of information and activity. Sorry to hear that. Hope you will find that your patience was more than worth it. Please submit a support ticket with proof that you are indeed an Aten Coin Holder; I would love to have a call with you directly. You need to be available and present on the various forms of social media to keep us in touch. The team has been doing a great job but we need more 'nuts and bolts' information coming from the company. Thanks. I hope this AMA will help with that. I am sure you can understand that, with a thousand things going on with the project, it is hard for me to participate in the myriad of discussions. Let’s see if we can keep this AMA going as a way to interact. When you created AML BitCoin, what market demographic did you have in mind? Are you hoping that the coin is adopted more in the private sector or as a general public use? We had the whole world in mind, except terrorists and criminals of course. In particular, commerce and government have expressed enthusiasm, since it enables them to enter the cryptocurrency world. Our approach of compliant digital currency was ahead of its time when we were creating it, but it is clear that governments around the world are changing the playing field, to our benefit. Do you believe that this coin will set a new standard for cryptocurrencies or do you think it will be a standalone project? We believe that we are the future of cryptocurrency. I'm a firm believer in your project. I believe that in order for mainstream use cases to occur digital currencies need to comply with regulatory standards. I'm interested as to what time zone you guys are operating out of. You and your management team, also your PR. A lot of responses are "copy and pasted" along with broken English. Broken English?! Goodness. I hope that doesn’t happen again, and I’d be very grateful if you could point out any occurrence going forward. I hope that some of the answers in this AMA will allay your concerns, and that you will continue to send questions. As for where our folks are, they are in the US, the UK, Asia, Latin America, Europe and, soon we hope, Africa. We hope to be everywhere, because of the 197 nations out there, we are pretty confident that almost everyone needs what we have developed. What is the exact date that the coin will be available for trading on an exchange? We are already on three exchanges right now. I assure you more are coming. What is the status of the patent filing? All patents are filed and have been continually updated. We are planning a major announcement soon that will be very pleasing; I assure you. Please stay tuned. What is the progress about acceptance by governments and/or other legal bodies? We are in discussions with almost a dozen governments for usage of the coin and underlying system in a multitude of applications. We need to wait until we conclude agreements before we can announce them, as we have found that governmental bodies are very queasy about premature publicity. What is the expected price of the coin, when launched? How will this be determined? The market determines the price of the token on the exchanges through a bid and ask system. Regulatory compliance requires that we make no representations about demand, pricing, or volatility as well as some other matters, because AML Bitcoin is a utility coin. Why is there no more recent publicity about the coin’s prospect? We will make announcements at the appropriate time. As stated above, we have been working toward several goals. If you would agree to allow countries, central banks and large financial Institutions to create their own cryptocurrencies using the AML BitCoin platform, how would this be advantageous for the AML BitCoin currency? Thanks for your question. The creation or migration of cryptocurrencies to our platform would require that these coins use ABTC for their transactions. We are ascertaining other ways through licenses and hope to have several in hand when the public announcement commences. Will the biometric identity be done before going on to the exchange and is this software available now or is it still in development? The biometric identity will be deployed once we are ready to convert our token to the AML BitCoin coin. We hope that is about 6 months after launching. The biometrics platform (digital identities) will be available in the near future for everyone to see in its beta version. It was announced that 60 million coins were sold in the ICO and the remaining ABTC were to be used for mergers... will all the remaining coins be strictly held for this purpose? A total of 60 million coins were not sold. They were sold and distributed. We have around 13 Million remaining coins that are being used for strategic partnerships. There are several uses of the remaining coins, including most prominently mining. Is there any consideration in merging with another cryptocurrency (i.e. BTC) to offer existing cryptocurrency compliance? We are not contemplating any mergers, but other digital currencies will likely contact us for various reasons. We are already in negotiation with a number of such companies. Will the patent-pending technology be uniquely associated with ABTC? No, we do not think it would be socially responsible to prevent others from being compliant – and the license deals will establish ABTC as the premiere crypto, with potentially hundreds of coins using us for their transaction fees. Given that you have traveled extensively promoting AML Bitcoin do you have any expectations in regard to global market acceptance of ABTC? Everywhere I go I am met with unbridled enthusiasm about our project. Everywhere. I have noticed that since the AML KYC have been spotlighted, many trading institutions have stepped up to meet compliance regulations for cryptocurrency. How does this affect ABTC? We suspect they will contact us and will join our ecosystem, further bolstering our project. With regards to the AML listing, do you intend to release the coin after the non provisional patent status has been approved? Trading has already started my friend. What is time frame for releasing Bitcoin Brigade documentary? Well, it’s actually a reality show, not a documentary. I think they call them docu-soaps? Or something like that! Please see the other AMA answer which gives you all the info on the show. Thanks! Can you say something about the challenges of KYC/AML? For example, how can bad actors be prevented from creating wallet addresses and selling them to unauthorized individuals? Does the KYC/AML process also need to go through regulatory approvals, that would act as a barrier to other cryptos achieving main stream adoption? Our process will require the provision of authentic personal identification documentation to trusted third parties who will verify those documents, ensuring that real parties are the only ones able to participate in the AML BitCoin ecosystem by the creation of a Digital Identity. Then, the use of biometric digital identification to access personal information, will ensure that bad actors are unable to steal the identity of those in the system. All of our technology is in compliance with existing laws protecting finance systems worldwide. For other cryptos to qualify, they must negotiate a presence on the AML BitCoin platform, which will require use of ABTC for their transaction fees, etc.